The southern lands of Ithilien, from the hills of Emyn Arnen in the north to the River Poros in the south. 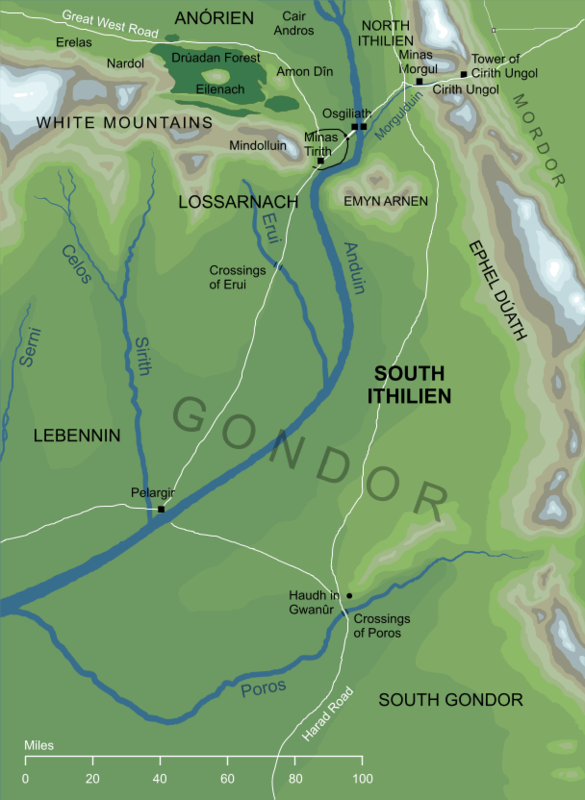 The border that separated North and South Ithilien is not formally defined, but it most likely followed the course of the stream known as Morgulduin (which would have had a different name at the time Ithilien was established). We know for sure that the hills of Emyn Arnen fell within South Ithilien, so it must have extended approximately as far northward as Osgiliath and Minas Ithil (later Minas Morgul) making the stream a suitable natural border dividing North and South Ithilien from one another. The southern border of South Ithilien is more clearly delineated. It was formed by the river Poros, beyond which lay the wilder lands of Harondor or South Gondor. Original content © copyright Mark Fisher 2000-2001, 2017-2018. All rights reserved. For conditions of reuse, see the Site FAQ.